Currently we are not taking special orders over the web until possibly November of 2005. We are sorry for any inconvenienced this will cause anyone, however, please do see us at the Sterling Renaissance Festival and at the Maryland Renaissance Festival for wonderful items in stock. Thank you! Please print out the Full Measurement Form or the Item Specific Form and the Order Form. Please fill out both forms clearly and completely. Mail, FAX: Please call for instructions or email the 2 forms. Payment must be made in US funds to Fantasia in the form of charge cards, MO, or checks. Please see Payment options below. We also offer payment plans. Call or email us for further information. Please call us at (607)836-7523 or email at "fantasiainfo@yahoo.com" for any questions. We try our best to answer all queries within 3 business days. However, during Festival Season (please click here to see schedule) it will take longer. We will do our best to stay on top of things, however Festival time for us is really hectic. Shipping is done via US Priority Mail (Overnight is available upon request, but it is pricey for heavier items) and is fully insured. For US customers it will cost about $10 -20.00, for most items, $25 to $45 for the heavier items of Capes, Cloaks, Coats and Court Dresses. Final costs will be sent to you before processing. International customers will need to pay the costs of shipping, handling and when the package arrives, their own customs. Please Beware: it is extremely high and the customs is paid on your end on top of price and shipping. --> We accept credit cards over the phone(607)836-7523 (Master Card, Visa and Discover). Please do not send credit card information through email. It is not secure!! You may send the information via FAX or within 2 emails. Sorry, but no COD's and we do accept Personal Checks through the mail, however, the item will be held until the check has cleared, up to 10 days. Due to Bank costs, we must enforce a return check fee of $25. A Money Order or a Credit Card enables us to ship the completed item within 24 hours after receiving verified payment. We do encourage Special Orders, since we are always out of stock before or after our Festival season and we only charge extra when an order deviates from our original designs or fabric choices. Otherwise, something made in a color that you want, and your size, is really just a piece "off the rack", found just for you! However, during our hectic Festival Season, it is difficult to get orders out in a timely fashion. Please bear this in mind when ordering. We would rather do an order in payments at an earlier date, then try and get it done and sent while making stock. In our experience, it just does not happen to the satisfaction of our customers or ourselves. Fantasia's Refund Policy: We Guarantee all materials and workmanship. If you are not satisfied with your purchase, then contact us for permission and instructions and immediately return the item, unworn and undamaged. We will give you a credit towards your next purchase or refund your money, "as cheerfully as we can muster". Refunds and credits, however, may be excluded from any Special Orders that deviate from our "normal" clothing designs, colors or fabrics. We do apologize for any inconvenience. Sorry, but Our Prices are subject to change without notice. We will confirm all orders of the price and shipping before processing. We do our best to stay consistent and competitive, and keep our prices updated, but things happen! The following may also cause your order to be higher than listed price. Any changes to the original order must be made in writing prior to construction of garment and may incur additional fees. Please NOTE: There is at least a 10 - 50% surcharge for Special Orders that deviate from our normal clothing designs and fabrics. These items may not be refundable. There may be an extra charge for Rush Orders. We usually can get things out to you in 6 to 10 weeks. However, please, do let us know of an event or special deadline. When in doubt, call or email, for we get seasonally very busy twice a year! (Holiday and Faire Season) This can significantly delay delivery date. Shipping and insurance are in addition to list price. Sorry but all International Sales are Final. The customs for going to you and then coming back is just too horrendous and difficult to deal with! A 50% non refundable Deposit is due to start work. Final payment due before shipping. Fantasia will not be responsible for incorrect sizing due to measurements supplied by the customer or if customer changes weight/size after order is placed. We do our best to catch measurement discrepancies, however, some do slip by, so please take your measurements very carefully and have patience with us when we do not believe the numbers. All order and customer information is kept completely confidential. We do not do spam or sell it and destroy all credit card information unless customer requests us to keep it "on file"
By placing an order with us, we assume that the customer agrees to these terms and conditions of sale and by us accepting the sale, we guarantee that the item is as described or better. Thank you for your interest in our products! We hope to do business with you for many years to come! The Full Form is below but it is best to go to the print friendly Measurement Form. For list of specific item forms, i.e. 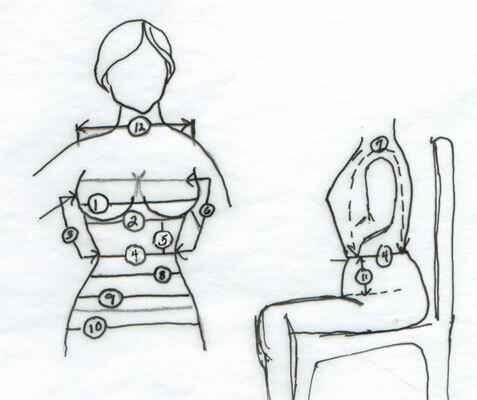 for Bodices, CorsetsMen'sns, etc, please go to Item Specific Forms. These each have only the numbers needed for ordering that specific item. Please have friend measure you in your underwear or tight clothing with a "sewing/cloth" measuring tape. Do not do this your self, for it distorts the true measurements. We can only make the size right if the measurements are true. Check drawing below for corresponding numbers to measurements needed. Right now it is a picture of a woman's frame, however, some of the measurements are needed for men's garments too! Measure 3 inches down from natural waist and take hip measurement at that point. So that you need not endure the entire "Full Measurement Form", here are some to access just for a specific item that you wish to order. Print these out and send them. Please do follow all instructions and the diagram for tape measure placement. Thanks! Card Member agrees to pay total in accordance with agreement governing use of such card. FAX: Please call for instructions. Even copy and email to: fantasiainfo@yahoo.com and please put in the subject - "Web Order"
Thank you for your order! We are looking forward to doing business with you. Web site designed & maintained by Lyla. Please report any problems or suggestions to her. Thank you.